KFC's Cheesy Bacon Bowl Giveaway! A few weeks ago I got an email asking if I wanted to try KFC’s new Cheesy Bacon Bowl. Are you kidding? Of course I would LOVE to try it! Being a huge fan of KFC to begin with, there's no way I could miss this opportunity. 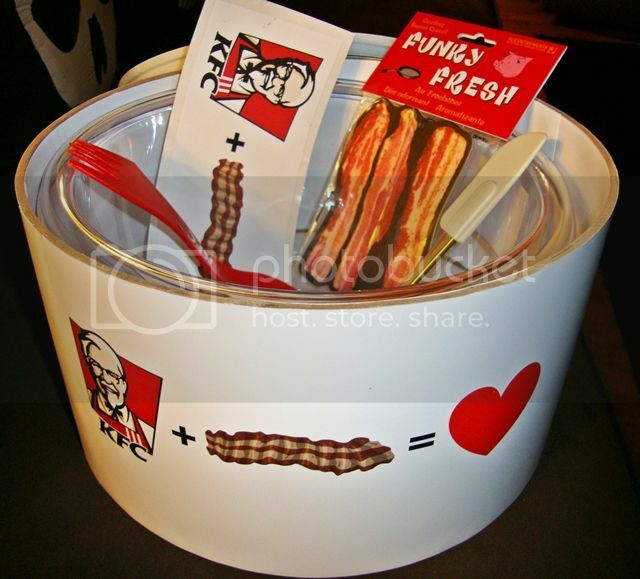 A bowl inside an awesome KFC + Bacon = Love "hat box"
I must give my apologies to the nice woman who sent this to me because it took me a little longer than I thought it would to actually get to KFC. But, I finally made it this weekend and, WOW, that Bacon Bowl was delicious! I'm already dreaming about going back to get another one. Now here the even better part - I get to give one lucky follower a Cheesy Bacon Bowl Taste Test Kit! That's right, it's a giveaway! All you need to do is leave me a comment about how much you really want to try the Bacon Bowl and why. I'll take comments for the next three days and then pick a random name out of the KFC + Bacon = Love bowl. Please don't leave an anonymous comment as I'll need to email you to let you know if you've won! 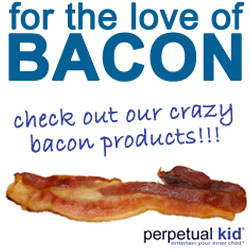 After you leave a comment, head on over to KFC.com to check out their new bacon-centric commercials. Good luck! Yes, it's real. Really, really real. 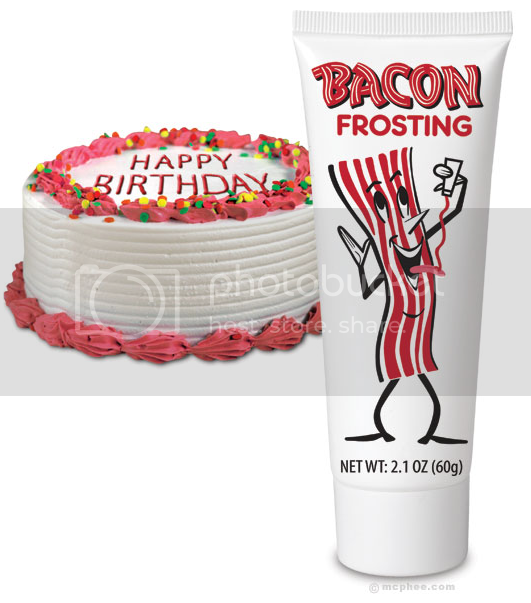 Keep a tube of Bacon Flavored-Frosting on hand to finish off a dessert masterpiece, add sweet smoky delight to any dish, or indulge in a delicious squirt right onto your tongue. $5.00 for 2.1 oz. I finally had to replace my Jeremy Fish bunny skull shower curtain. As much as I loved it, plastic shower curtains only last so long. 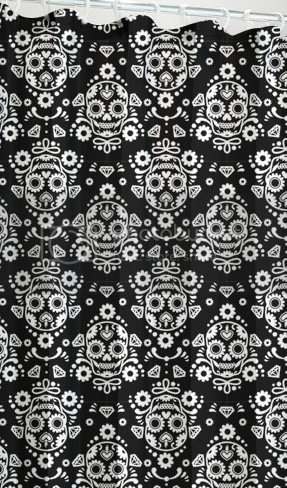 I was super happy when I found this sugar skull shower curtain at HowCool.com. I was only $19.14 and it's nice quality too. Looks awesome in my bathroom! 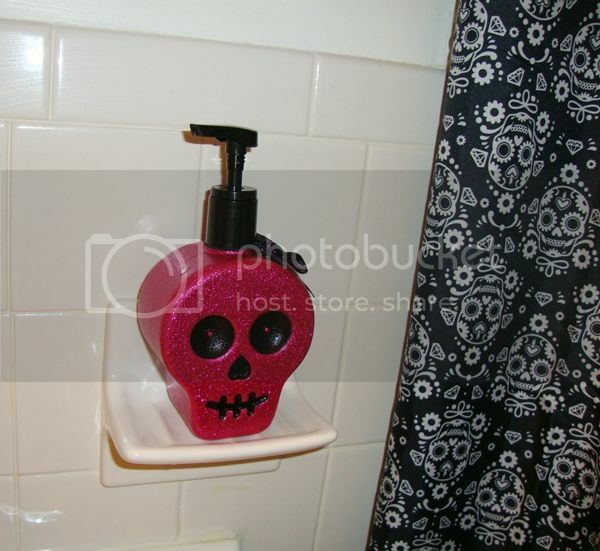 And here it is in my bathroom, next to my sparkly skull soap dispenser, which I bought for full price at Bath & Body Works but you can get on clearance right now for only $3. Move fast though! 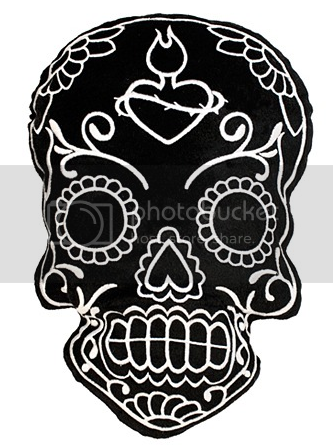 I'm about maxed out with the amount of skulls I can decorate my bathroom with. I've got the shower curtain, hand towels, bath rug and soap dispenser. About the only thing I don't have in there is a skull toilet seat but I'm thinking that might be overdoing it? 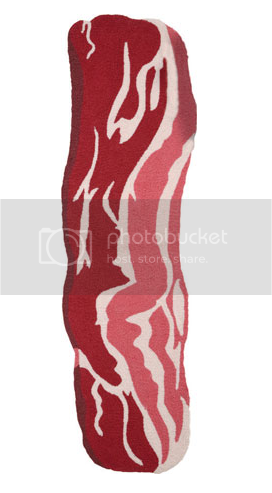 I know it's hard to believe, but after four years of bacon blogging, I've finally found a bacon rug! You know I put my order in the minute I saw it. Hand-hooked, polyester and acrylic with cotton backing. For indoor use. 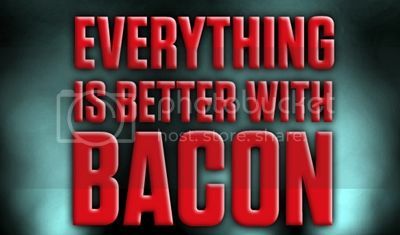 52"L x 15"W.
If you need me, I'll be sitting outside by my mailbox waiting for my new bacon rug to arrive. 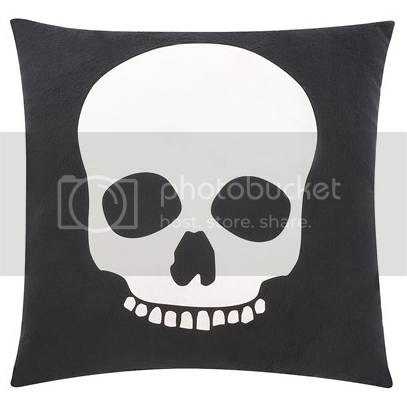 If you haven't gone to Target yet for their 2011 Halloween and Skull stuff, stop reading now and run there. I'm late in posting this and the cool stuff has a tendency to fly off the shelves. I was stalking Target until they got their Halloween selection on the shelves and I've had to go back a few times, each time they had different items, and hidden throughout the store. Not everything is on their website either, so you have to GO. 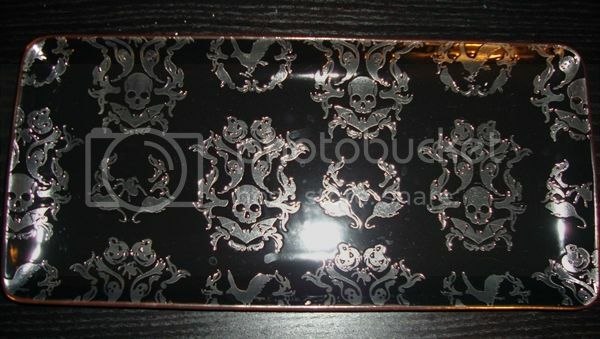 Skull Bath Rug - this one is my favorite find of the season and I did a happy dance around the store when I saw it. It's not on the website and wasn't in the stores the first two times I went shopping. 3rd time was the charm! 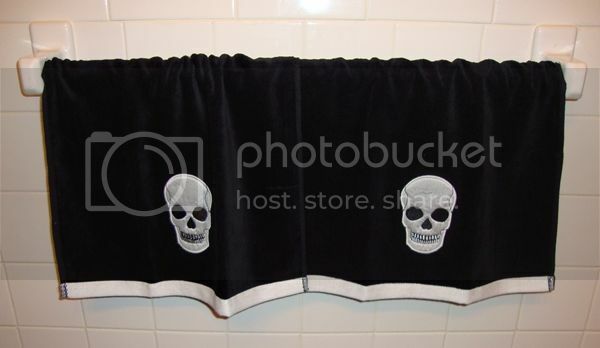 Skull Hand Towels - Another item not on the website. 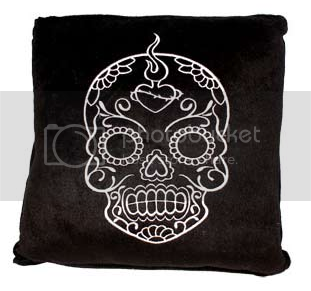 These are velvety and satiny and look awesome with the skull bath rug. 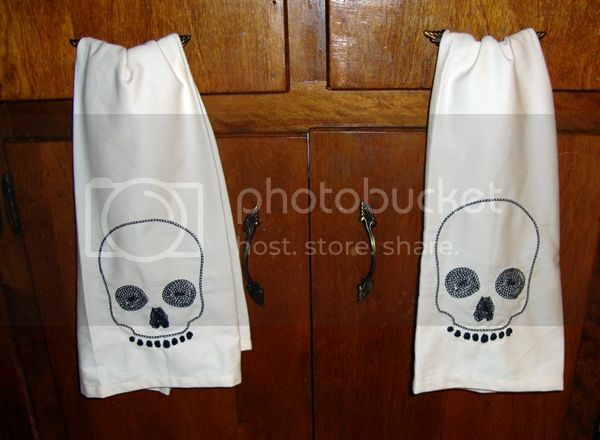 Skull Kitchen Towels - These are out of stock on the website but plenty in the store last time I went. 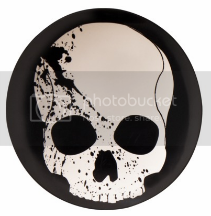 Skull Porcelin Tray - one of the first things out at Target this year and my store only had three total. You'll be lucky to still find one I think but it's definitely worth looking for. They also had a bunch more skull cookie jars but they were the same as last year and I already have three of them. I also picked up some black skeleton arm salad tongs. More skull salt & pepper shakers, garland, lights, too much to even list them all. Needless to say, I'm broke, my apartment is bursting at the seams with more skull stuff than I know what to do with and I'm really happy.